Experimental and clinical studies beginning in the 1950s defined many of the problems inherent in stem cell transplantation. Successful stem cell transplants, pioneered mainly by the Seattle group led by Professor Donnall Thomas, were made possible by the definition of the HLA system, improvements in supportive care, and by the ability to control, to some extent, GvHD. The routine use of allografts for patients with leukaemia was introduced in the mid-1970s. The first allograft to be done in Christchurch took place in April 1979 on a child with Aplastic Anaemia. The first autograft was done in 1986. To date (July 2014), 1051 stem cell transplants have been carried out. An informal group of staff from Haematology and Paediatrics carried out the initial transplant. During the 1980s, the Bone Marrow Transplant Committee became established, and in 1991, the South Island Bone Marrow Transplant Unit was established with funding coming mainly from the South Island Bone Marrow Transplant Trust (SIBMT) with support from the Hospital Boards in the South Island and Government. Details of the SIBMT Trust and the fundraising activities that led to the building of the Bone Marrow Transplant Unit, the Accommodation Facility (Ranui House), and Research Laboratories are shown in the History of SIBMT Trust. Since 1979, details of our transplant activity have been reported to the CIBMTR database, and more recently to the EBMT and ABMTR registries. Refer to Publications from the Christchurch Stem Cell Transplant Programme. Beard M.E.J. Bone Marrow Transplantation: Technique and Current Indications. NZ Med.J. 91: 99-103; 1980. Darlow B.A., Abbott G.D., Beard M.E.J., Fox H.W.J. & Hamer J.W. Bone Marrow Transplantation for severe aplastic anaemia. NZ Med.J. 91: 86-89; 1980. Stewart R.J., Duley J.A., Aallardyce R.A., Beard M.E.J. & Fitzgerald P.H. The wound fibroblast and macrophage II. Their origin studied in a human after bone marrow transplantation. Br.J.Surg. 68: 129-131; 1981. Beard M.E.J., Heaton D.C., Hamer J.W., Watson J., Abbott G.D., Bremner J., & Snape L. Right atrial catheters for long-term venous access. NZ Med.J. 93: 41-43; 1981. Beard M.E.J., Heaton D.C., Hamer J.W., Watson J., Fox H.W.J., Crosier P.S. & Abbott G.D. Bone marrow transplantation for acute leukaemia and severe marrow aplasia: An analysis of five patients. NZ Med.J. 94: 249-252; 1981. Hollings PE, Fitzgerald PH, Heaton DC & Beard ME. Host origin of in-vitro bone marrow fibroblasts after marrow transplantation in man. International Journal of Cell Cloning 1984; 2: 348-355. Heslop HE, Heaton DC, Hart DNJ, Allen JR, Abbott GD & Beard ME. Allogeneic bone marrow transplantation at Christchurch 1979-1985. New Zealand Medical Journal 1986; 99: 318-321. Beard ME. Bone marrow transplantation (review). New Zealand Medical Journal 1987; 100: 486-488. Jeffrey GM, Beard ME, Ikram RB, Chua J, Allen JR, Heaton DC, Hart DNJ & Schousboe MI. Intranasal amphotericin B reduces the frequency of invasive aspergillosis in neutropenic patients. Am J Medicine 1991; 90: 685-692. Beard ME, Inder AB, Allen JR, Hart DNJ, Heaton DC & Spearing RL. The costs and benefits of bone marrow transplantation. New Zealand Medical Journal 1991; 104: 303-305. Baker BW, Smith MP, Abbott GD, Beard ME, Spearing RL & Heaton DC. Aplastic anaemia in Christchurch Hospital 1979-89. New Zealand Medical Journal 1991; 104: 468-470. New Zealand Bone Marrow Transplantation Study Group. Bone marrow transplantation in New Zealand. Bone Marrow Transplantation 1994; 13: 733-736. Hill GR, Hart DNJ, Moore AF & Morris CM. Donor leucocyte infusions in the treatment of chronic myeloid leukaemia in relapse post bone marrow transplantation. Pathology 1996; 28: 51-53. Hill GR, Inder A, Patton WN & Hart DNJ. High dose therapy and autologous bone marrow versus blood cell rescue. New Zealand Med J 1996; 109: 445-448. Snowden JA, Patton WN, O’Donnell JL, Hannah EE & Hart DNJ. Prolonged remission of longstanding systemic lupus erythematosis after autologous bone marrow transplant for non-Hodgkins lymphoma. Bone Marrow Transplantation 1997; 19: 1247-1250. Manley R, Fearnley D, Patton WN, Newhook C, Spearing RL & Hart DNJ. Syngeneic peripheral blood stem cell transplantation for severe aplastic anaemia. Bone Marrow Transplantation 1997; 20: 1009-1010. Snowden JA & Heaton DC. Development of psoriasis after syngeneic bone marrow transplants from psoriatic donor: further evidence of adoptive autoimmunity. Br J Dermatology 1997; 137: 130-132. Withington S, Chambers ST, Beard ME, Inder A, Allen JR, Ikram RB, Schousboe MI, Heaton DC, Spearing RL & Hart DNJ. Invasive aspergillosis in severely neutropenic patients over 18 years: Impact of intranasal amphotericin B and HEPA filtration. Journal of Hospital Infection 1998; 38: 11-18. Fearnley DB, Whyte LF, Carnoutsos SA, Cook AH & Hart DNJ. Monitoring human blood dendritic cell numbers in normal individuals and in stem cell transplantation. Blood 1999; 93: 1-10. Snowdon JA, Hill GR, Hunt P, Carnoutsos S, Spearing RL, Espiner E & Hart DNJ. Assessment of cardiotoxicity during haematopoietic stem cell transplantation with plasma brain natriuretic peptide. Bone Marrow Transplantation 2000;26:309-313. Stevens JM, Patton WN, Heaton DC, Spearing RL, Shaw G, Bowie D, Smyth D & Comenzo R. Autologous PBSCT in patients with cardiac amyloidosis. Bone Marrow transplantation 2000;26:588-589. Hock BD, Haring LF, Ebbett AM, Patton WN & McKenzie JL. Differential effects of G-CSF mobilisation on dendritic cell subsets in normal allogeneic donors and patients undergoing autologous transplantation. Bone Marrow Transplantation 2002; 30: 733-740. Chee L, Spearing RL, Morris C, McDonald M, Hanrahan V, Ebbett A, Scott R, Florkowski C, Walmsley T & Patton WN. Acquired myeloma-associated Type III hyperlipidaemia treated by nonmyeloablative HLA-identical sibling allogeneic stem cell transplant using a donor with essential thrombocythaemia (ET): Evidence of engraftment without manifestation of ET in recipient. Bone Marrow Transplantation 2005; 35: 1213-1214. Sullivan M, Browett P & Patton N. Private umbilical cord blood banking: a biological insurance of dubious future benefit! New Zealand Med J, 2005;117:no 1208. http://www.nzma.org.nz/journal/118-1208/1260/ © NZMA. Nieto Y, Patton WN, Hawkins T, Spearing RL, Bearman SI, Rabinovitch R, Zeng C, Baron A & McSweeney PA. Tacrolimus and mycophenolate mofetil after non-myeloablative matched sibling donor allogeneic stem-cell transplants conditioned with fludarabine and low-dose total body irradiation. Biol Blood Marrow Transplant 2006 12:217-225. Sanders, J., Pithie, A., Ganly, P., Surgenor, L., Wilson, R., Merriman, E., Loudon, G., Judkins, R. and Chambers, S. A prospective double blind randomised trial comparing intraluminal ethanol with heparinised saline for the prevention of catheter-associated blood stream infection in immunosuppressed haematology patients. Journal of Antimicrobial Chemotherapy (2008) prepublished on line, July 11 2008. Nivison-Smith, I., et al. (2011). "Allogeneic hematopoietic cell transplant for multiple myeloma using reduced intensity conditioning therapy, 1998-2006: factors associated with improved survival outcome." Leuk Lymphoma 52(9): 1727-1735. Trengrove, A. M., J. E. Schouten, et al. (2012). "Comparing Pegylated and Conventional G-CSF in the Mobilisation of PBSC in Patients with Myeloma." Biology of blood and marrow transplantation: journal of the American Society for Blood and Marrow Transplantation 18(2): S384-S385. Fernyhough, L. J., V. A. Buchan, et al. (2013). "Relative recovery of haematopoietic stem cell products after cryogenic storage of up to 19 years." Bone Marrow Transplant 48(1): 32-35. Fernyhough, L. J., B. D. Hock, et al. (2013). "Survival of myeloma patients following the introduction of thalidomide as a second-line therapy: a retrospective study at a single New Zealand centre." Intern Med J 43(2): 130-137. Ganly, P., et al. (2014). "Outcomes of allogeneic haematopoietic stem cell transplants at a small New Zealand centre - does size matter?" ntern Med J 44(7): 683-689. Butler, A. and A. Thurston (2015). "CMV and EBV Reactivation after Allogeneic Transplantation." Biology of Blood and Marrow Transplant 21(2): S244. Patton, W. N., et al. (2016). "Graft Transit Time has no Effect on Outcome in Unrelated Donor Myeloablative Haematopoietic Cell Transplants (HCT) Performed in Australia and New Zealand: An Australasian Bone Marrow Transplant Recipient Registry (ABMTRR) Study." Biology of Blood and Marrow Transplant 22(3): S345-S346. First allogeneic bone marrow transplant (HLA identical sibling for severe aplastic anaemia). First auto transplant for lymphoma. Second allogeneic BMT procedure for treatment of relapse following first Allo BMT. First partially matched related donor transplant. First auto transplant for neuroblastoma. First matched unrelated donor (MUD) transplant. First transplant for myeloma (allogeneic). First autologous peripheral blood stem cell transplant (PBSCT). Donor leucocyte infusions (DLI) for relapsed CML. First purged (mafosfamide) auto BMT for AML. 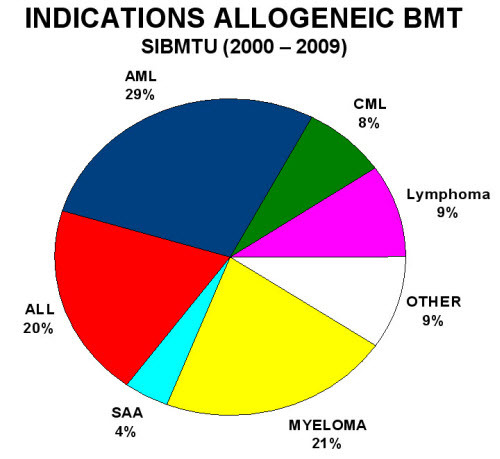 Auto BMT extended to germ cell and other solid tumours. World first syngeneic PBSCT for severe Aplastic Anaemia. First auto transplant for breast cancer. First HLA identical sibling PBSCT. Use of DLI for myeloma relapse post Allo BMT. First auto transplant for amyloidosis. First RIC (Reduced Intensity Conditioning) SCT. First unrelated donor SCT for severe aplastic anaemia. First RIC SCT for B-cell CLL. First allogeneic SCT for myelofibrosis. First unrelated RIC SCT for AML. First unrelated RIC SCT for Hodgkin Lymphoma. First Adult RIC double cord transplant.